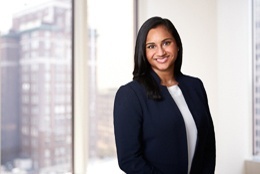 Komal Patel is an antitrust associate in the firm’s New York office. Her practice is focused on antitrust litigation, merger analysis and antitrust counseling. She has advised and represented clients in industries including financial services, insurance, telecommunications, forest products, hotels and the pharmaceutical industry. Komal earned her JD with Honors from Emory University School of Law. At Emory, she was a member of the Moot Court Society, won the 2012 NYU Moot Court Competition and was elected into the Order of Barristers for her excellence in oral advocacy and brief writing skills. She previously served as a judicial intern to the Honorable Steven M. Gold of the Eastern District of New York. She has also interned at the United States Attorney’s Office for the Northern District of Georgia in the Economic Crimes Section and in the Enforcement Division of the Securities and Exchange Commission. Before beginning her legal career, Komal was a Teach for America corps member and taught high school mathematics in New York City.